Fishing Resort on Fletcher Pond - just west of Alpena! Bass, Northern Pike, Perch, Crapies, Sunfish, Bluegill. Enjoy 9,000 acres of quiet fishing on Michigan's premier bass lake. No jet skis, water skiers or large power boats, just pure fishing pleasure! Fletcher Pond, well known for it's trophy bass and monster pike, is and endless stump and weed field perfect for sustaining enormous numbers of large fish. Anglers Hideaway is also open through the hunting season and the winter for ice fishing and snowmobilers. 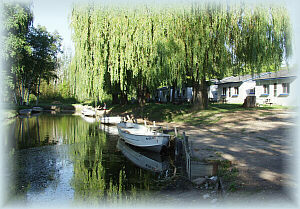 Shanty rentals, bait and tackle are also available on Fletchers Pond.